We have a limited supply of mini-probes stored on the Venti. While we have the patterns for their parts stored in memory, their construction is complicated. 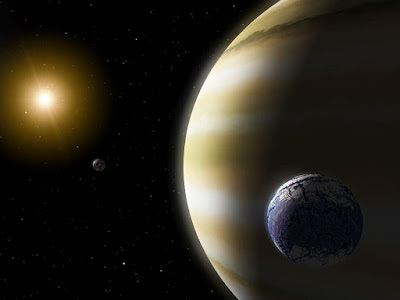 Even so, I have decided to send one to the second moon of Tau Ceti h. The signal we received from there last year has continued without any observable decrease in strength. Even though I’ve only been able to allocate a small percentage of my processing capacity, I have extracted some meaning from the transmission. It is a stream of sensor readings from a point in orbit around the icy moon. It seems logical to assume that there is some sort of probe investigating the moon, as the readings correspond to conditions on the moon’s surface. There is no way of knowing why it was sent there. If they are curious about their surroundings, like humanity, then it is likely that other probes were launched. Unless this was their first? I believe that it was deployed before the cataclysm the Cetians suffered took place and will continue to operate until its power source dies. We have no way of knowing when that will be, but it does provide us with an opportunity. At the moment we know little about their technology or what we will encounter when we arrive at Tau Ceti e. I’ve unravelled a considerable amount of data from the second section of the looped signal, but the information so far has been of a scientific and mostly theoretical nature. I’ve not learned anything of a practical nature about the Cetians themselves or their technology. This probe provides me with a glimpse of how they operated. Looking for more correlations from the earlier signals with what I have recently learned, I’ve re-examined the beacon signal we received back in 2121. It lasted for 2 years, but contained the information of the rogue planet approaching Tau Ceti e.
Only I’m not so sure it was a rogue planet as we first believed. With a better understanding of how the Cetians structure their information, the situation doesn’t seem so clear cut. In particular, the sphere of data we designated a planet seems to be an outer shell – although of what, I don’t know yet. The mass of the object is much smaller, so much so that it couldn’t have caused the catastrophe I’d assumed. More notably, the changes in orbit for both the planet and the new object don’t match the orbital changes we calculated or have observed since arriving in the Tau Ceti system. Something much stranger than we originally thought has happened here. I love reading about space and astronomy as it shows us what is outside our world, reading about universe and planets and all those stars make you think about the one who created this all. Interesting blogs!